Florida Villa Site Now Live!! 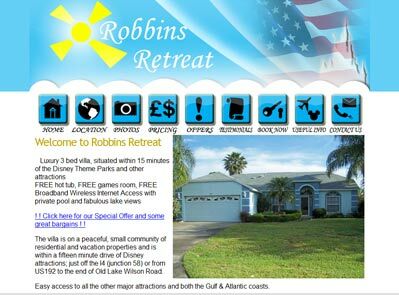 Check out my latest website for Robbins Retreat! This entry was posted in Website News on April 20, 2009 by Tony Phillips. Please feel free to explore my site, click on the icons to naviagate the site. I’m Tony Phillips from Codnor in Derbyshire. I have a degree in Digital Entertainment from the University of Derby and I now work on developing Virtual Learning Environments for schools in Derby. I have over three years experience using WSS, SharePoint 2003 and MOSS 2007 (Microsoft Office SharePoint Server 2007). I have been working on a project to create a virtual learning management system in the city of Derby. We have nine Schools sites and over 2000 users. Photoshop, SharePoint Designer 2007, Microsoft office 2007 and much more (see CV). For the smaller primary schools, I used CSS and HTML to fully customise the site. During the production of the pastoral and business side of the VLE, I have become very competent and creative with custom lists and much more advanced concepts. My success at creating a VLE from scratch has changed the schools philosophy on how to communicate with the wider community and how to interact with parents on a much more intimate level. The SharePoint portal is used on average 1600 times a day. Using SharePoint’s usage data and google’s analytics, I have produced reports on the VLEs success and which areas are used the most at certain times throughout the day (see page 4). joomla, moodle and wordpress. I feel that I have the responsibility and passion to administrate and design much bigger business SharePoint sites. My passion for graphic design has led me to have great photoshop skills to create modern attractive proffessional sites. Example sites can be seen on my website. My design skills include HTML, CSS, Flash, ActionScript, Photoshop, SharePoint Designer 2007, 3DS Max and many more. My personal skills give me a polite and helpful attitude under pressure. I have gained these skills from experience in my other jobs working as a customer sales assistant and working as a football steward where a calm and helpful attitude is very important. My passion is to learn more and develop skills to help me in the business workplace. Please take a look at my site and contact me http://www.tonyishere.co.uk/contact.php if you require any further information. This entry was posted in Education News, Personal Message Announcement, SharePoint News, Website News on April 20, 2009 by Tony Phillips.